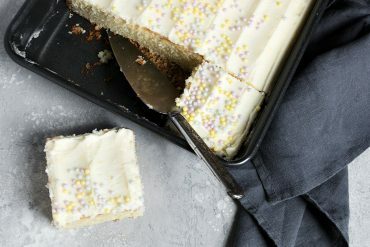 Classic, easy and delicious! 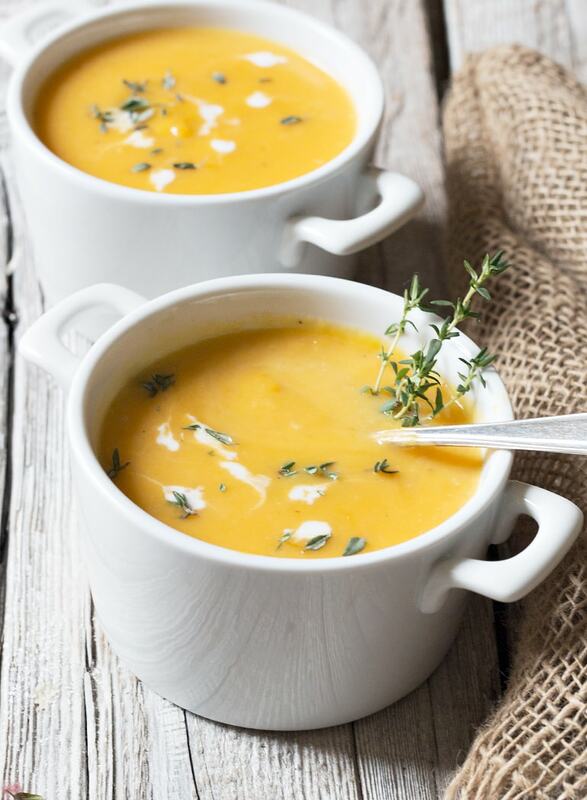 My Roasted Butternut Squash Soup, is … simply perfect! 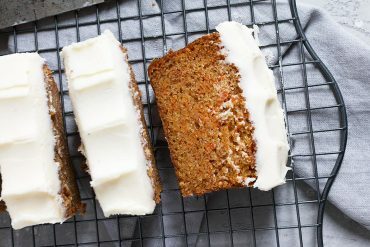 This recipe was first published 3 years ago, but I wanted to update the post and re-share it, as it remains my favourite and one of the first things I make when the weather cools every Fall! I know there are dozens of versions of roasted butternut squash soup out there, but this is the one that I make and have made for years, so I though I’d share it. It’s simply perfect and if you’re craving a simple and satisfying squash soup this Fall, I promise you won’t regret making this one. This soup starts with roasted squash. Roasting the squash really brings a wonderful flavour to this soup. It also means you don’t have to peel or cut the butternut squash into chunks, and if you’ve ever done that, you know that’s a bonus! I’ll often roast the butternut squash off ahead, maybe the night before or the morning of the day I’ll be making the soup. Simply roast, let cool a bit, then scoop the roasted flesh out in to a bowl and refrigerate. You can also make this soup ahead and re-heat, which is perfect for Thanksgiving. If the soup thickens while sitting in the fridge, simply thin with a little more chicken stock, if needed, but re-heat first, then add stock. Added to the soup is a bit of onion a bit of thyme and it is finished with maple syrup and heavy cream. 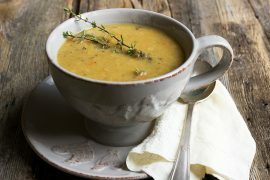 Optionally, add a bit of grated apple to your soup, for another layer of flavour to this classic butternut squash soup. The addition of a bit of grated apple to the soup is optional, so don’t worry if you don’t have an apple on hand. It does add a lovely depth of flavour to the soup. If using a sweet apple, you may wish to reduce the amount of maple syrup you add to the soup slightly. 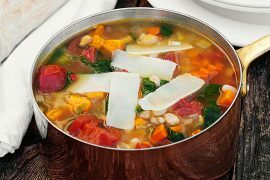 The most important tip for making this soup is to taste at the end of cooking and adjusting the seasoning as necessary. As with all soups, the saltiness of the stock used will vary, so you may need to add only a little or a bit more, but you will probably need to add some. I can’t stress this enough. Honestly, the one thing that I’ve learned that has made the biggest improvement in my cooking is to learn to salt properly. So taste your soup and add salt, then taste again and add a bit more if you need to. 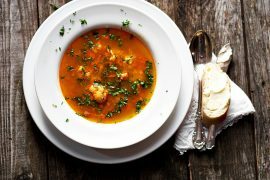 This is my favourite version of this soup, but when I’m looking to change it up a bit, I’ve added a bit of curry powder or smoked paprika. You can make this soup vegetarian by using vegetable stock. If you don’t eat dairy, you could substitute coconut cream for the heavy cream or just omit the cream altogether, for a less creamy, but still delicious soup. So many ways to make this one your own! When it came time to garnish my soup for photos, I kept it simple with just a few drops of heavy cream, that I ran a skewer through and a few fresh thyme leaves. For a heartier version, garnish with some simple homemade croutons (or maybe bacon-fat crisped croutons!). A delicious, classic roasted butternut squash soup, flavoured with maple syrup and optionally, a bit of apple. A great Fall soup or perfect for your holiday table! Can be made ahead and re-heated. Roast the squash (can do ahead and refrigerate): Preheat oven to 375° Cut squash in half lengthwise. Using a spoon, scoop out and discard the seeds and dark orange stringy flesh. Place squash cut side down on to a baking sheet. Note that you want the squash to lay perfectly flat, so you can get some caramelization going for best flavour. If they won't all lay flat, use two baking sheets if necessary and rotate their position in the oven half way through roasting. Roast in pre-heated oven for 60-70 minutes or until very soft when you press on the top of the squash. Remove from oven and using a spatula, flip the squash halves over and allow to cool a few minutes. Using a spoon, scoop all the roasted squash flesh out and in to a bowl, being careful not to take any of the skin. Discard squash skins. If making the soup immediately, measure out the amount of cooked squash needed for the soup and set aside. Any extra squash can be refrigerated or frozen and used for another purpose. For the soup: In a large soup pot or Dutch oven, melt butter over medium heat. Add diced onion and cook, stirring, until onion has softened and is translucent, but not browned. Add the measured roasted squash. Add the chicken broth and stir to combine well. *If using the optional shredded apple, add it now as well. Add the fresh thyme sprig. 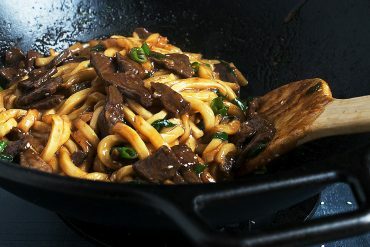 Bring to a light boil over medium-high heat, stirring occasionally, then reduce heat to medium-low and allow to simmer, uncovered, for 20-30 minutes to blend the flavours. REMOVE THYME SPRIG and discard. Using an immersion blender (or alternately in small batches in a blender) puree the soup well until smooth. In the soup pot, add the maple syrup and the heavy cream to the pureed soup. Stir well to combine and allow to cook over medium-low heat a few minutes to warm through. Taste soup. Add salt as needed and some freshly ground pepper. You don't want to be skimpy with the salt! Salting well is the key to bringing out all the great flavours in this soup. Maple syrups vary in intensity. If you don't notice a subtle maple taste in the soup, add a bit more maple syrup, as needed. Serve warm garnished with drops of heavy cream and fresh thyme leaves. If you like, use a skewer to run through the drops of cream to make a pretty design. Make-Ahead: Make this soup ahead and refrigerate for several days ahead. Rewarm on the stove-top over low heat. If soup has thickened, thin with a bit of additional chicken broth. Makes 6 full size servings or would serve 8-10 as an appetizer-sized soup. 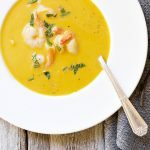 A delicious slow-cooker version of butternut squash soup, served with shrimp for a complete meal. A chunky butternut squash soup, with lots of vegetables in the soup and delicious bacon fat fried croutons! This soup looks just heavenly! I love roasted butternut squash. And it’s so much easier – and tastier – than peeling and cubing it. When I roast the squash there is quite s lot of liquid in the pan which becomes toasted and brown. Should the liquid be discarded or included in the soup? Hi Derek and no, you should just discard the liquid. Sometimes it scorches a bit and that is usually quite bitter tasting. I literally refer to this soup as Holy Water. It is tied with Eggs Benedict as my favorite food. I can’t say enough good things about this recipe… I’ve made it on multiple occasions and will continue for years to come! I have made this now three times. Family loves it so much . I have made other versions but have to agree this version is a winner. Your tip in roasting the squash is very smart. I make it exactly as you say. Fantastic ! This might be the best soup I’ve ever made!! Wow! Wow! Wow! Amazing!! I can’t stop eating it. I’m going make this for everyone that comes over this fall and winter! So glad you are enjoying it, Aleks :) Thanks! I agree with you. Just made this for myself for supper tonight. Simply delicious! So glad to hear, Bev :) Thanks! So glad you enjoyed it Jenny and love that you were able to adapt it to your need so nicely :) Thanks! I agree Jenny, 5 stars as I usually don’t like butternut squash soup either. I added aunt jemima’s pancake syrup because I didn’t have maple syrup, and didn’t have thyme, but added a tiny pin of cinnamon. Awesome! So glad you enjoyed it, Samantha! And I have busted out the Aunt Jemima’s a few times, too :) Thanks! Omg. I just made this soup and it is amazing, I added a pinch of nutmeg . We were going to have it tonight but I think a day in the fridge will meld the flavours even more. Can’t wait until tomorrow to enjoy. This was my first attempt at butternut squash soup,it will not be my last. Roasting the squash and adding the juices that escaped made it truly amazing. Thank you posting this recipe . I loved this soup!!! I included the apple, so reduced the pure maple syrup to 1/4 cup. The soup was intoxicatingly delicious!!! I made this for dinner guests and garnished with toasted pumpkin seeds – They loved it.!! 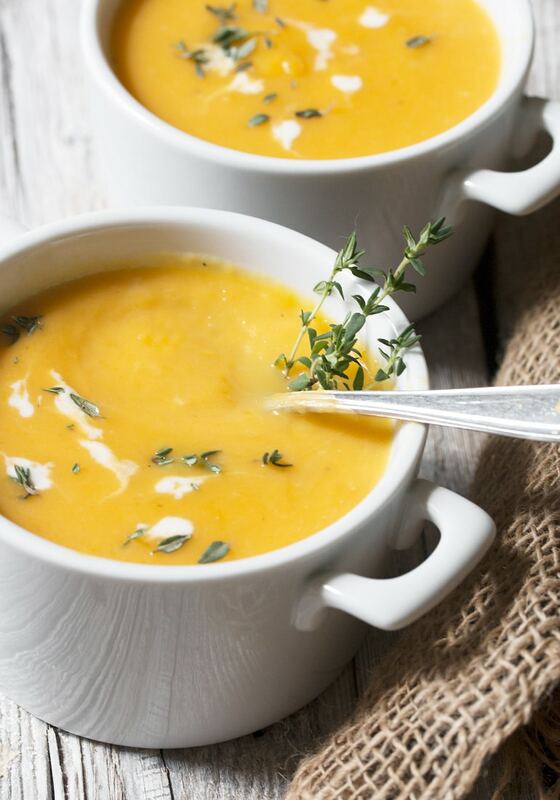 If you are looking for the quintessential roasted butternut squash soup – This is it!!!! Do allow 2 hours to make this soup as there is cooking, cooling, and blending to do. So glad to hear, Jennifer :) Thanks! This is the most delicious butternut squash soup ever! Made it today because I wanted to try something new instead of my old reliable and this one is stellar. Thank you. PS I didn’t even follow the recipe exactly and it still turned out extremely well. So glad to hear, Lore and now worries! I rarely follow the recipe exactly either :) It’s a very forgiving soup. Thanks! I made this soup a couple of days ago, following the recipe almost to a T (I had to switch out the maple syrup which i thought I had for honey). It is absolutely, incredibly delicious. Thank you for an excellent recipe! 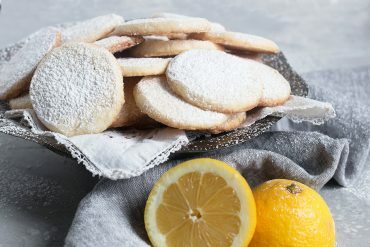 One question; if i wanted to make my next batch a little less sweet, what would you suggest I add/subtract, while still keeping a great flavour? Just finished making this and OMG I wanna eat the whole pot myself!! I had to substitute with coconut milk for allergies and you’d never know! I’m loving the maple syrup in it! My husband did his own this year for the first time and am loving all the ways I am finding to use it in cooking! Amazing recipe! We blended the apple into the soup. Our family doesn’t like overly sweet, how much maple syrup would you add just to add flavour without the sweetness? Hi Stef, I would start with a couple of Tablespoons, then taste and add a bit more if you feel it needs it :) Thanks! Looks absolutely perfect!!! Love the colour of the soup. Yum! Thanks Irene and glad you enjoyed this. I will often roast the squash off ahead, as well. Then it’s just a short trip to a delicious pot of soup when I”m ready. Made this recipe awhile back when local squash was available. Roasted the squash ahead of time which cut down prep time on the day it was made. I’ve roasted squash for many years as I find it more flavourful. Maple syrup is a regular pantry item. 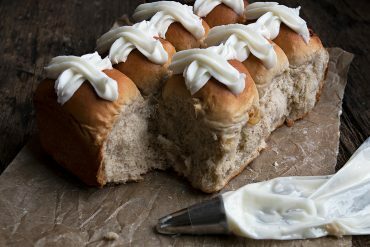 Don’t usually use heavy cream (except for desserts!) but I did for your receipe. Hi Jill, You really don’t need to go the slow cooker route with this one. It comes together super quickly once you have the squash roasted. And that’s where you can “do ahead”. I haven’t frozen this, but I have roasted the squash up to several days ahead. Then I scoop it out and refrigerate. From there, it’s really all into a pot, add the broth etc and your soup is ready in about 20-30 minutes. From there, you could use a slow cooker to keep it warm, if you like. Won’t hurt it. As for quantities, I think the recipe as written should get you about 8-ish servings, if it is a “starter” soup. So for 30, I would at least triple the recipe. If you want to be super sure of lots, I might 4x it. You’ll need a big pot :) Enjoy! My mom and I made this soup over the weekend and it’s absolutely delicious! We left out the apple and maple syrup but it was still nice and creamy with the perfect amount of sweetness. This recipe is the perfect fall soup! So glad you enjoyed this! Roasted butternut squash is so lovely, isn’t it :) Thanks! Just made this today, on this dreary rainy day in northern Ontario, delicious! We had that same dreary day! So glad this soup brightened it for you :) Thanks! Made it this evening and it’s absolutely delicious! It warms you up a cool fall day! Thank you for sharing. Jennifer, I love all your recipes, easy to follow and so tasty! I have a question of the roasting of the butternut squash; should I oil the roasting pan? Hi Faith and thanks so much :) I don’t grease my pans. There is a lot of moisture cooking off the squash from underneath, so I think that keeps it from sticking. I’ve never had an issue with them sticking to the pan at all. Enjoy! Made it today with acorn squash from my parent’s garden, it is simply delicious. I prebaked the squash as you suggested and I will not cook squash any other way from now on: so easy and brings out the flavor so well, I tasted it and decided that it was so sweet on it’s own that it didn’t need the maple syrup (I’m watching my sugar intake). Added a little water to compensate and the full amount of cream. Love it! Thanks so much, Milena :) It is one of my favourite soups. Such a comforting bowl, for sure! I love this soup – butternut is a favorite at our house. I shared this recipe in a roundup that is going crazy – but I’m not complaining! I really need to make this soon – thanks for letting me include it in the roundup! This is one of my favorite ways to celebrate the start of fall, your soup is gorgeous, what a color! 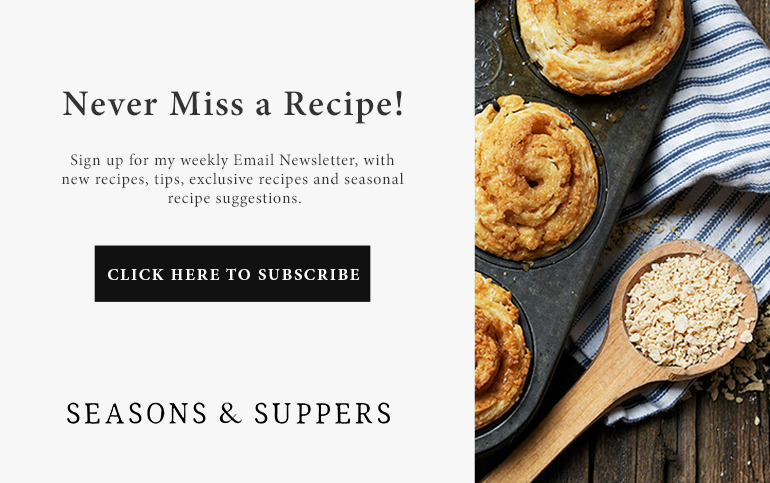 I’m glad you updated this post because butternut squash soup is one of my favorites!! Yours looks absolutely perfect, of course!! I could go for a bowl (or 3) of this right now! Cheers! Winter day has finally hit here in Calgary. I still have a butternut squash from the Okanagan fall harvest so I figured it was time to do something with it. I tried your recipe and thrilled with the results. Looking forward to lunch on this snowy winter day. Thank you for sharing. So bright and beautiful! It’s hard to believe that it’s so simple to make. Thanks so much, Karen. One of my favourite soups! Great version of butternut squash soup. So flavourful and so easy. Made it once to rave reviews so I’m making it again tomorrow night. Thanks for sharing. I made this soup. It was easy and incredibly delicious! Thank you for posting it! Just made this recipe and added some sweet potatoes (roasted along with the squash) since I had them handy and WOW – just delicious. 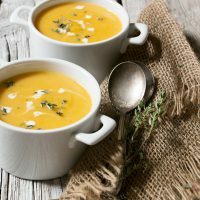 I have tried so many variations of butternut squash sop or bisque through the years and this one WINS! and so much easier too. So glad you enjoyed it Rebecca and yes, it’s a great soup for a variety of flavour tweaks! I regularly make butternut squash soup and always following new recipes to recreate it. You definitely can consider I will be making your recipe Jennifer, I have never seen a recipe using maple syrup before! Yum! 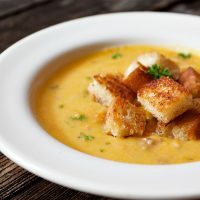 This looks delicious – I’ve never made butternut squash soup (this must change) but I had no idea you put maple syrup in it! It sounds so good! Thanks Jessica. I love it with maple syrup, but I’ve also tried (and enjoyed) butternut squash soup with apples or pear in it – something with a sweet note is nice. I love butternut squash soup -it’s a perfect fall dish. Yours looks so pretty and I bet it is tasty, too! This just screams Fall and comfort to me! I’ve been chilly the last few days so this would fix it perfectly! This soup would be perfect, Pamela. Enjoy! 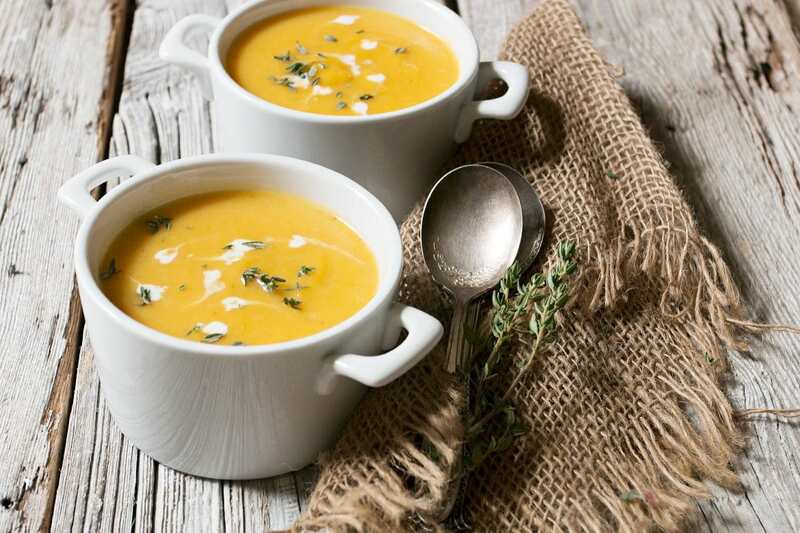 The world can never have too many butternut squash soup recipes. Gorgeous photos and recipe, Jennifer! I was under salting things for the majority of my life. Not until I started working in restaurants did I learn to salt things properly. It’s a great skill to have :-). Have a great weekend! Thanks Liz. I was the same way with salt. When I finally figured it out, it was like an cooking epiphany! You have a great weekend, as well. Safe travels! This recipe is nearly identical to my mom’s tried and true BNS Soup. Therefore, I KNOW this soup is delicious. Looks beautiful, too! 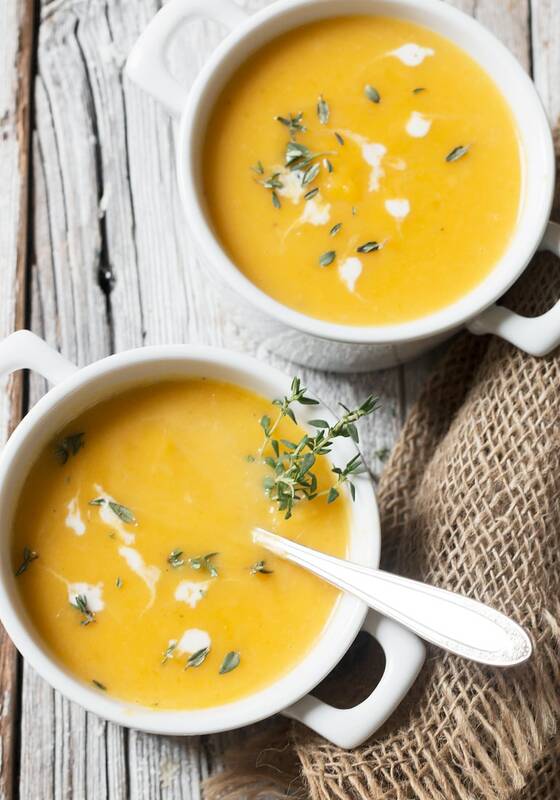 I love butternut squash soup, the maple and cream finish sounds heavenly! Thanks Meghan. I love butternut squash ravioli, too! Have you tried it as a pasta sauce? My daughter made some last year and I was pleasantly surprised at home good it was. There may be a million other versions, but that doesn’t make this one any less special! Love the simplicity of this. Definitely a keeper. Thanks Katrina! I know I’ve tried many versions and always come back to this one.